Yeah, he’s the same man who was a fully credited animator on the majority of films during Walt Disney’s animation heyday, and also the author of over thirty children’s books. One, his autobiography, was Caldecott Honor book in 1990. But what does that mean in real terms? Well…my brothers LOVED Bill Peet. Whereas my sister and I would beg for just one more chapter of a Narnia book, my brothers would beg my mother to reread a Peet classic like Merle the High Flying Squirrel or The Whingdingdilly. Another favorite was Cyrus the Unsinkable Sea Serpent, which is as awesome as its title makes it sound. 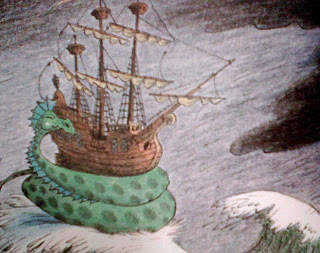 The story is pretty simple – sea serpent wants something cool and different in life, but doesn’t want to take part in the usual sea serpent-y activities, like terrorizing ships and ruling the seas. So he becomes involved with the fate of one particular boat, and many adventures and calamities ensue. Cyrus is basically a picture book, so I can’t say much else without spoiling it. But know that the illustrations are charming, entertaining and silly/fun. The story is quirky and unexpected and perfect. I’d recommend this book for any kid, big kid, or kid at heart. And per my family’s experience: great for energetic young ones who have a hard time sitting still. 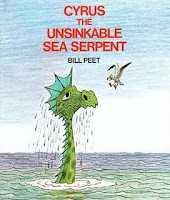 Meet and love Bill Peet and Cyrus the Unsinkable Sea Serpent! I don't think I've seen any of his books, and I think my five year old is at the perfect age to enjoy these. I'll have to see what I can find at the library. This looks sweet! I'll have to see if I can find it.